An irresistible, nostalgic, insightful—and "consistently intelligent and funny" (The New York Times Book Review)—ramble through classic children's literature from Vanity Fair contributing editor (and father of two) Bruce Handy. The dour New England Primer, thought to be the first American children's book, was first published in Boston in 1690. Offering children gems of advice such as "Strive to learn" and "Be not a dunce," it was no fun at all. So how did we get from there to "Let the wild rumpus start"? 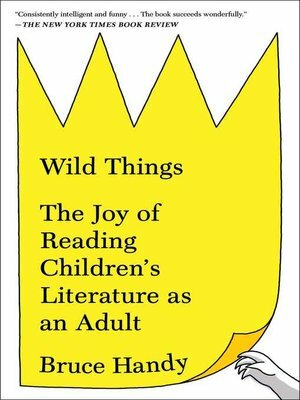 And now that we're living in a golden age of children's literature, what can adults get out of reading Where the Wild Things Are and Goodnight Moon, or Charlotte's Web and Little House on the Prairie? A "delightful excursion" (The Wall Street Journal), Wild Things revisits the classics of every American childhood, from fairy tales to The Very Hungry Caterpillar, and explores the back stories of their creators, using context and biography to understand how some of the most insightful, creative, and witty authors and illustrators of their times created their often deeply personal masterpieces. Along the way, Handy learns what The Cat in the Hat says about anarchy and absentee parenting, which themes are shared by The Runaway Bunny and Portnoy's Complaint, and why Ramona Quimby is as true an American icon as Tom Sawyer or Jay Gatsby. It's a profound, eye-opening experience to re-encounter books that you once treasured decades ago. A clear-eyed love letter to the greatest children's books and authors from Louisa May Alcott and L. Frank Baum to Eric Carle, Dr. Seuss, Mildred D. Taylor, and E.B. White, Wild Things is "a spirited, perceptive, and just outright funny account that will surely leave its readers with a new appreciation for childhood favorites" (Publishers Weekly).